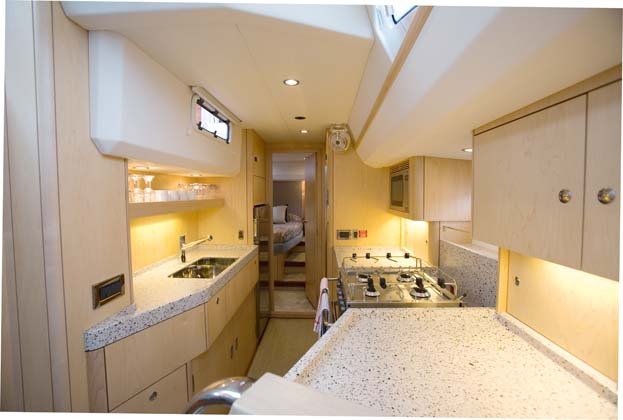 If you’re considering sailing to warmer waters, whether the Mediterranean, Caribbean or further afield, but are worried that life on board will be more akin to camping than the comfort you’re accustomed to at home you are unlikely to be alone.However, there are many ways in which an existing vessel can be adapted to offer many of the comforts and conveniences we take for granted in our daily lives. This compact unit is also designed to provide a wireless network to share the incoming data stream, whether from wi-fi, satellite or mobile phone network. For connection to the internet it’s said to support a wider range of devices, including nearly every satellite phone, 3G/4G cellular phone and long-range wi-fi booster solutions. 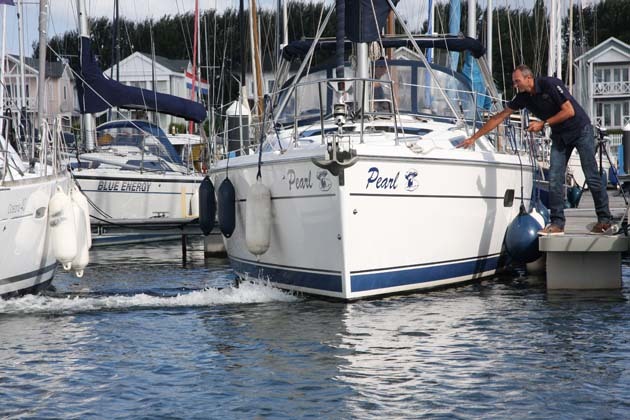 Although many yachts now have bow thrusters, if you struggle in tight spaces it might be worth considering adding a stern thruster to make manoeuvring in a strange port even easier. 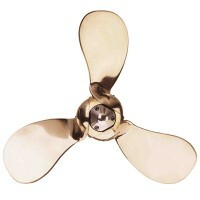 An interesting alternative that came to the market five years ago is the jet thruster produced by Holland Marine Parts. Instead of an impeller near the end of the boat this pushes a small jet of water out of a nozzle in the appropriate direction and is starting to gain traction in the mainstream market. For instance, the new Dufour 460 has a jet thruster installed. Advantages are that you don’t need a large tunnel for a bow thruster’s impeller – the water exits through a 50mm diameter nozzle that can be positioned on the waterline close to the bow or stern. In addition, there’s less chance of flotsam in the water being dragged into the impeller and there are no shear pins that will leave you without thrust if they break. A boat that requires extreme physical effort to sail is no fun, especially if sailing short-handed. It’s therefore worth analysing the deck layout to see if there are easy ways to reduce friction. Typical problems include ageing equipment with sheaves that don’t run freely and lines that are forced to turn through unnecessarily large angles. In many cases it’s possible to reduce friction by 50 per cent or more, which will instantly translate into easier handling. However, it’s also worth considering powered winches – being able to hoist and reef the main, and sheet the headsail home, all at the touch of a button, can significantly reduce the demands on a small crew. Windlasses tend to spend much of their lives coated in salt spray, yet are all too often neglected until you start spending most nights at anchor. Clearly that’s not the time to discover your windlass is not working properly, or is marginally sized. It’s also worth considering whether a model with a warping drum would be useful – a powered winch on the foredeck can be invaluable in harbour in gale-force conditions and warping drums certainly come into their own for use with lazy lines when moored stern-to Mediterranean-style. A chain counter is also a valuable addition, taking the guesswork out of laying sufficient scope and for optimum control when retrieving the anchor – well worth spending around £150 on. It’s also worth looking at your propeller. Feathering three- or four-bladed props tend to be much more efficient in reverse than a fixed-blade model, which means the boat gathers steerage way more easily, with less prop walk. As a result, the handling of boats with a shaft-driven prop located near the rudder can be transformed. The finer pitch setting is used for motoring into a head sea, when the maximum power of the engine needs to be transmitted to the prop. 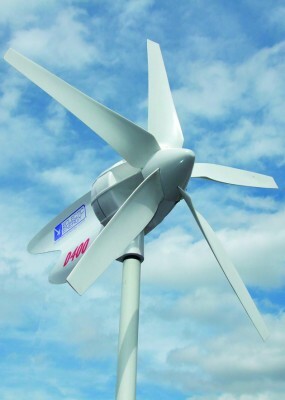 Life on board can be transformed if you never have to worry about the amount of electrical power you consume. Much has changed in this respect over the past decade. Many of today’s appliances, including LED lighting, iPads and tablets, and low-energy TV screens draw far less current than their forebears. The cost of solar power has dropped significantly at the same time as efficiencies have improved, and efficient hydrogenerators that are easy to deploy have also been developed. For yachts that don’t want to install a 240V generator, fuel cells may be a viable way to top up batteries on an occasional basis. For more on this subject see the June 2015 issue or our feature online. Yachting World’s ARC Survey consistently shows that fitting a foot pump, along with a saltwater pump at the galley, is invaluable for ocean crossings. Over the course of a few months even a small crew can get through an enormous amount of bottled water. Even disregarding environmental considerations, this can be an absolute pain to stow as well as presenting a logistical problem to lug it on board in the first place. These work with standard onboard water pressure and can be configured to filter all tanked water, or can be plumbed into a separate faucet so that only drinking water is filtered, which will extend each cartridge’s 3-3,800lt lifespan. They can also be used for the supply to an icemaker. Replacement cartridges range from £77 to £99. Don’t wait until you’re baking under a relentless sun before considering how to improve life below decks. The most important single thing is to ensure there’s a good flow of air through the boat. This is relatively easy to achieve if you’re at anchor, when a simple windscoop or two will do the trick, as the boat will tend to be head to wind most of the time. But it can be difficult to promote a good airflow in quarter cabins and aft cabins. It helps if the hatches are hinged on the aft edge, but decent fans may still be needed to supplement the airflow. Don’t stint on the quality – only the best combine a decent throughput with the kind of quiet, vibration-free running essential to prevent the fan disturbing your sleep. There’s no reason why you shouldn’t be as comfortable in bed afloat as you are at home. 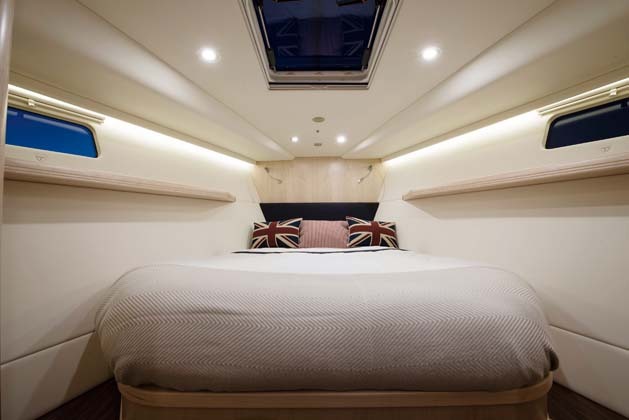 There are a number of companies that offer pocket-sprung mattresses custom-built to fit the unusual shape of yacht berths and can incorporate soft, medium or firm springs, or a split mattress. To prevent mouldy bedding it’s essential to add ventilation matting beneath the mattresses to cut down on condensation. The industry standard is a mesh anti-condensation layer of around 1cm which provides for ample airflow, as well as keeping the mattress above any condensation that does form: £30 per bunk. No one wants to spend any more of their time afloat than is absolutely essential engaged in domestic chores. Dometic’s new central vacuum system is one way to ensure floors and upholstery can be quickly cleaned at the touch of a button. Not so long ago this was solely the preserve of the biggest yachts, but the introduction of compact standalone units makes it viable for smaller vessels. Granted, to use it while at anchor you’d also need to run a generator all the time, but the biggest benefit of aircon is when you’re in a marina berth with shore power. As well as the boat not lying head to wind in a berth, as you’re closer to shore the wind strength is likely to be diminished and temperatures will be higher at night – three reasons why aircon can be a boon. More than one can be fitted to create a simple air conditioning system – the Gunboat 66 Tiger Lily has two of Dometic’s 16,000 BTU/hr Vector Turbo units to cool her bridgedeck saloon, plus further 8,000 BTU/hr units for each stateroom. 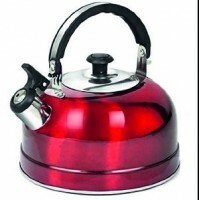 GN Espace (gn-espace.com) has developed a range of marine cookers that address typical problems. All have a full-width grill and an oven with two or three-level cooking. The company also takes care to insulate ovens to the highest levels. This saves gas – by up to 50 per cent – while reducing the heat transmitted to the rest of the boat. Hobs range from a standard two-burner unit up to a large five-burner model that includes one that’s sufficiently powerful to use a wok. Another option is to get rid of the gas system entirely and convert to electric. Induction types are more efficient, so will draw a little less power and will contribute far less to creating unwanted cabin heat than gas cookers. This is an area that’s all too frequently compromised in the typical yacht galley – however, it’s also one that GN-Espace has addressed. For example, the Gastronorm sinks use ideas from professional catering to create an efficient multifunction food preparation and washing up area. Key considerations include excellent insulation – the thicker the better – and a location for the compressor that provides adequate ventilation. It’s also worth considering water-cooling systems, which reduce the coolant temperatures and therefore significantly reduce power consumption. Sail repairs on the fly – how to make essential fixes while at sea ! August 19, 2016 / Surfer Chick / Comments Off on Sail repairs on the fly – how to make essential fixes while at sea ! During last year’s ARC I was to be found at one point on the pulpit restitching the foot tape of our headsail. I was clipped on a short tether with one hand on the boat. 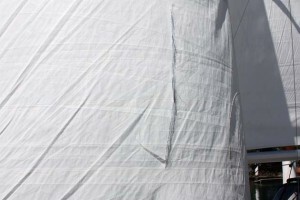 The spinnaker had been pinned too tight and had rubbed through the stitching of the furled headsail. The sail was progressively furled up so the damage was in reach and it was surprisingly easy to rethread new stitching through the existing holes – and the repair was good enough to stop the damage spreading. That really was a repair on the fly. Not all sail repairs are so accessible and straightforward, but there is no reason why most problems can’t be solved at sea with a reasonable repair kit. Losing the use of a sail could cost days on a long passage, so it’s well worth giving some thought to what can be done, and what you have to hand. Remember ‘a stitch in time saves nine’, and this is never more true than when in the middle of an ocean! As part of routine daily deck checks, take time to give the sails a once over and check to make sure no seams are starting to come apart – it really doesn’t take long for a seam to ‘unzip’ itself right across the sail. If you see any loose stitching don’t hesitate to get the sail down and fixed; it can potentially save a big headache later. Stitching a long seam back together is a longwinded and laborious process, but it is much easier than dealing with ripped fabric. With a seam it is just a case of working your way methodically back through all the holes. Find a comfortable place on deck to work as it may be difficult to manhandle a large sail down below. 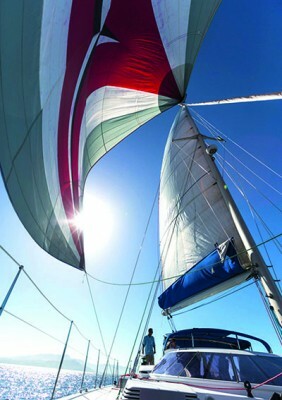 For a particularly large repair it may be necessary to have two people working together, one each side of the sail, so that they can pass the needle back and forth to each other. This is useful where the damaged part is in the middle of the sail. 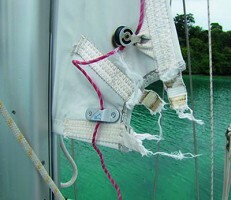 Spreader and rig chafe – When sailing downwind the mainsail spends a lot of its time resting on the rig. On Skyelark we have a straight spreader rig, which is more forgiving than swept-back spreaders, but even so we still pad our spreaders with pipe insulation and have reinforcement patches for the spreaders at each reef point and on the batten pockets. 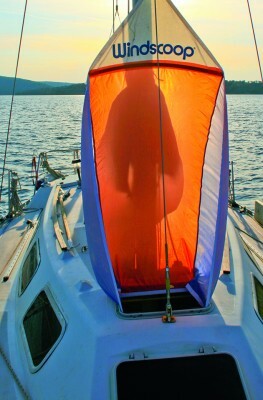 The bottom of the headsail where it exits the foil, and foil segment joins – You may be able to lower the halyard enough to reach the damaged section then reinforce with sail repair tape, but If conditions don’t allow, then keep a wrap or two in the sail to take the pressure off the damage. Spreader ends, and anything mounted on the front of the mast can be a hazard – Ideally reinforce the sail and fit smooth cages around protrusions. We also wrap foam round our spreader caps on long passages. Clew rings and webbing – A couple of times we have seen the stainless steel clew rings on mainsails part. As a short-term fix you could simply sail with a reef in, or for a longer term solution we have stitched in a webbing loop. Soft clews also fail, but it’s relatively easy to stitch the webbing, with the help of a sailmaker’s palm. Spinnakers – Anything sharp is a hazard, particularly near the boom if you do letterbox drops, so check everything is taped up. Spinnakers also like to get caught between the shrouds above the spreaders; you can close off this gap with bungee. Having a good sail repair kit on board is a must for long-distance cruising. As well as standard sailmaker’s needles, we also keep a good selection of ordinary embroidery needles as we find the larger needles too big for the majority of small repairs. You will also need good strong cottons of various sizes, a sailmaker’s palm and a small pair of pliers for getting through tougher, reinforced parts of the sail. 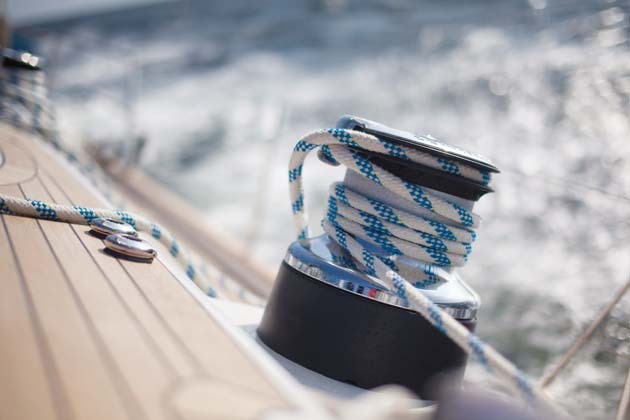 In addition, sail repair tape for both Dacron and spinnaker materials, larger sections of sail repair material, webbing and Venture tape are essential to have on board. The bottom of a hot kettle can be useful to get the sail repair tape to bond well onto the sail. Round off the corners on any patches so they are less likely to try to peel off. Reinforce any loose stitching immediately. Tape over any split pins or sharp points around the boat that could be snagged by the spinnaker. Have a sailmaker service your sails before any long trip to check for wear and tear and identify any weak points. When you put reefs in the main, make sure the lines aren’t trapping any part of the sail, as this can cause wear or make a hole in the fabric. Tape both sides of the repair for extra strength. If taping just one side of the sail rub chalk (or any powder) onto the opposite side to absorb the glue where the join isn’t perfect, to stop the sail sticking to itself. For any repair that is not on a seam, a patch fix is going to be required, and for anything except spinnakers then a Dacron patch is the best thing to use. It even sticks very well to many exotic and laminate sails on the film side, but not on some silicone-covered or resin-based sails so check what you have. Dacron repair tapes come in various thickness rolls and you can buy larger sheets. Preparation is key and, along with patience, forms the basis of a satisfactory and long-lasting repair. Clean and dry fabric. You need to get rid of any salt, so begin with a freshwater rinse, then allow to air dry thoroughly. If time is an issue and you’re not blessed with tropical sunshine use a towel and a hair dryer. Next remove any other residues with rubbing alcohol – this will also help dry the material as it evaporates. Prepare your work space. 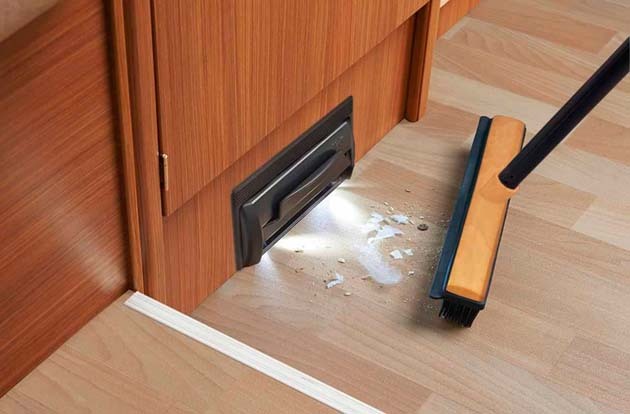 You need to be in a safe, dry, comfortable place with a flat surface to work on – in an ideal world that would be below at the saloon table, but if that’s not possible try a chopping board, or even bring a bunk/sole board on deck for bigger repairs. Line up the sail. Usually ‘white’ sails tear in lines that can be pieced together to maintain the same shape, but these should not be pulled overly close together or made to overlap or the shape will change and create loading. If the tear has gone off in different directions do the longest first. Sails are not naturally flat, they are made up of panels to create a depth which can make laying it on a flat surface problematic. You need to experiment with temporary folds and tucks in the cloth away from the tear to get it to lie as flat as possible. Lay over the patch or tape, starting at least 5cm away from the start of the tear, smooth it down gently making sure there are no high spots or creases in the patch. If you find it impossible to avoid forming a crease, cut the tape and carry on with a new piece, overlapping the original again. When cutting the repair cloth, radius the corners so that they are less likely to get caught and pull off – we like to apply a gentle heat and pressure to the patch to help it really stick – if you have a travel iron on board that’s ideal; if not a warm kettle or heavy-bottomed saucepan works well through a dry tea towel. If it’s in a high load area (close to the edges or a corner) or you have a long way to go, consider beefing up the repair with another layer on the other side. If you do this it is tempting for aesthetic reasons to use the same size patch, but this will create a weak spot and a crease point in the sail, so make it a different shape. Keep an eye on it and it should last well, but not forever so don’t fix and forget – you still need to find a sailmaker, and you probably have a feel for how urgently. The main difference between your repair and that of the sailmaker is a stitched border, which you can do yourself at sea and once you have come this far, and the sail is in front of you this is worth doing if you still have an ocean to cross. Ideally this should be in a zigzag pattern around the outside of a patch. A sewing machine would be great, but it can be done by hand. For small holes and temporary fixes sticky back spinnaker repair tape is fine, but for larger and more significant repairs we prefer to tape on a new patch with double-sided sailmaker’s tape (Venture is one brand). Many new spinnakers are no longer stitched and are assembled purely with tape, so there is no reason why a repair cannot be as good as new. The aim is to keep the panels the same shape as the original. Don’t try to ‘close the wound’ if fabric is missing, the cloth should stay in the same place as it was before to avoid generating unnecessary loads and stress lines – don’t worry if there are bits missing as the patch will now completely take over and any sail inside it is redundant. Use the same weight of cloth for the patch so it moves and stretches together – which is something spinnakers like to do. If you put stronger, heavier fabric to repair a lighter one it will create point loading at the patch edges, creating a weak spot. If the tear passes through a number of panels, then make the repair in stages, one panel at a time. This allows each panel to move and stretch as it was designed to. For larger repairs, use small strips of sticky back fabric to tack the repair in place – and where there is a gap in the cloth you can even stick down to the surface underneath to hold the whole section steady for applying the main patch. For high resin and silicone-based sails, like North 3Di, the most common method for repairing at sea is to use adhesive silicones. These are flexible and incredibly strong and, depending on the load area of the sail, it can be back up in a couple of hours, although should ideally be left and pressed together for 12 hours. I’ve read several blogs about Volvo 70 crew fixing top-of-the-range North 3Di sails in a couple of hours with 5200. A boat on the ARC last year did an excellent repair with Sikaflex and sail ties. As with a conventional repair, a clean, dry and flat sail is the key to success as well as using a patch of similar material. Even with conventional sails sometimes you don’t have the time or the equipment to make a proper repair and sometimes (mostly) duct tape isn’t enough. The same ‘cheats’ can get you moving again, but it may require more work to put the sail back to normal in the loft. It’s possible to hitch rides into the Pacific on yachts from California, Panama, New Zealand, and Australia, or around the yachting triangle Papeete-Suva-Honolulu. If you’ve never crewed before, consider looking for a yacht already in the islands. In Tahiti, for example, after a month on the open sea, some of the original crew may have flown home or onward, opening a place for you. Pago Pago, Vava’u, Suva, Musket Cove, and Port Vila are other places to look for a boat. Cruising yachts are recognizable by their foreign flags, wind-vane steering gear, sturdy appearance, and laundry hung out to dry. Good captains evaluate crew on personality, attitude, and a willingness to learn more than experience, so don’t lie. Be honest and open when interviewing with a skipper—a deception will soon become apparent. The weather and seasons play a deciding role in any South Pacific trip by sailboat and you’ll have to pull out of many beautiful places, or be unable to stop there, because of bad weather. The prime season for rides in the South Pacific is May-October; sometimes you’ll even have to turn one down. Be aware of the hurricane season: November-March in the South Pacific, July-December in the northwest Pacific (near Guam), and June-October in the area between Mexico and Hawaii. Few yachts will be cruising those areas at these times. A few yachts spend the winter at Pago Pago and Vava’u (the main “hurricane holes”), but most South Pacific cruisers will have left for hurricane-free New Zealand by October. Also, know which way the winds are blowing; the prevailing trade winds in the tropics are from the northeast north of the equator, from the southeast south of the equator. North of the tropic of Cancer and south of the tropic of Capricorn the winds are out of the west. Due to the action of prevailing southeast trade winds, boat trips are smoother from east to west than west to east throughout the South Pacific, so that’s the way to go. The common yachting route or “Coconut Milk Run” across the South Pacific utilizes the northeast and southeast trades: from California to Tahiti via the Marquesas or Hawaii, then Rarotonga, Niue, Vava’u, Suva, and New Zealand. Some yachts continue west from Fiji to Port Vila. In the other direction, you’ll sail on the westerlies from New Zealand to a point south of the Australs, then north on the trades to Tahiti. Some 300 yachts leave the U.S. west coast for Tahiti every year, almost always crewed by couples or men only. Cruising yachts average about 150 km a day, so it takes about a month to get from the U.S. west coast to Hawaii, then another month from Hawaii to Tahiti. Most stay in the South Seas about a year before returning to North America, while a few continue around the world. About 60-80 cross the Indian Ocean every year (look for rides from Sydney in May, Cairns or Darwin from June-August, Bali from August-October, Singapore from October-December); around 700 yachts sail from Europe to the Caribbean (from Gibraltar and Gran Canaria October-December). To enjoy the finest weather conditions many yachts clear the Panama Canal or depart California in February to arrive in the Marquesas in March. From Hawaii, yachts often leave for Tahiti in April or May. Many stay on for the Heiva i Tahiti festival, which ends on 14 July, at which time they sail west to Vava’u or Suva, where you’ll find them in July and August. From New Zealand, the Auckland to Fiji yacht race in June brings many boats north. In mid-September the yachting season culminates in Port Vila and by late October the bulk of the yachting community is sailing south via New Caledonia to New Zealand or Australia to spend the southern summer there. In April or May on alternate years there’s a yacht race from Auckland and Sydney to Suva, timed to coincide with the cruisers’ return after the hurricane season. To crew on a yacht you must be willing to wash and iron clothes, cook, steer, keep watch at night, and help with engine work. Other jobs might include changing and resetting sails, cleaning the boat, scraping the bottom, pulling up the anchor, and climbing the main mast to watch for reefs. Do more than is expected of you. A safety harness must be worn in rough weather. Anybody who wants to get on well under sail must be flexible and tolerant, both physically and emotionally. Expense-sharing crew members pay US$50 a week or more per person. After 30 days you’ll be happy to hit land for a freshwater shower. Give adequate notice when you’re ready to leave the boat, but do disembark when your journey’s up. Boat people have few enough opportunities for privacy as it is. If you’ve had a good trip, ask the captain to write you a letter of recommendation; it’ll help you hitch another ride. When you consider the big investment, depreciation, cost of maintenance, operating expenses, and considerable risk (most cruising yachts are not insured), travel by sailing yacht is quite a luxury. The huge cost can be surmised from charter fees. International law makes a clear distinction between passengers and crew. Crew members paying only for their own food, cooking gas, and part of the diesel are very different from charterers who do nothing and pay full costs. The crew is there to help operate the boat, adding safety, but like passengers, they’re very much under the control of the captain. Crew has no say in where the yacht will go. The skipper is personally responsible for crew coming into foreign ports: he’s entitled to hold their passports and to see that they have onward tickets and sufficient funds for further traveling. Otherwise the skipper might have to pay their hotel bills and even return airfares to the crew’s country of origin. Crew may be asked to pay a share of third-party liability insurance. Possession of dope can result in seizure of the yacht. Because of such considerations, skippers often hesitate to accept crew. Crew members should remember that at no cost to themselves they can learn a bit of sailing and visit places nearly inaccessible by other means. Although not for everyone, it’s the way to see the real South Pacific, and folks who arrive by yacht are treated differently than other tourists. A voyage to the islands of the South Seas figures in most sailors’ long-term plans, but their remoteness, which is one of their main temptations, keeps them beyond the scope of the average voyage. This is why, despite the proliferation of yachts worldwide, the number of boats cruising in the South Pacific Ocean is still relatively small and isn’t likely to increase much in the foreseeable future. No other part of the world offers so many cruising opportunities and diverse attractions as the South Pacific, from French Polynesia’s spectacular anchorages in the Marquesas to the turquoise lagoons of the Tuamotu Archipelago, from the giant statues of Isla de Pascua, or Easter Island, to the traditional villages of Vanuatu, the sheltered waters of Vava’u, in Tonga, and the remote island communities of New Zealand’s Tokelau and the nation of Tuvalu. The vastness of the Pacific Ocean, and the great distances that separate most island groups, make long passages a normal feature in this part of the world. The islands’ isolation and scarcity of facilities require that boat and crew be well prepared and self-sufficient. The safe sailing season in the South Pacific is well defined, with the weather usually fairly benign in the eastern part of this vast ocean. For sailors arriving from the east, the most critical decision concerns the timing of one’s arrival in the first tropical island group. Most boats transit the Panama Canal before the onset of the hurricane season in the Caribbean (June to November), with the most transits occurring in February and March. This is also the time when boats sailing from Mexico and Central America should start leaving for the South Pacific. Those who plan to sail in one season all the way to Australia or to the Torres Strait north of it need to reach the Marquesas not later than April to be able to cover the considerable distances ahead of them in only five months. Those with more time on their hands may decide not to sail the usual route from the Galápagos to the Marquesas but to make a detour to Easter Island and arrive in French Polynesia by that route. From Tahiti, in French Polynesia’s Society Islands, the classic trade-wind route continues to the Cook Islands, Tonga, Samoa, Fiji, Vanuatu, and Australia, with countless worthwhile diversions en route. For sailors starting from the eastern coast of the United States or Canada, a voyage to the South Pacific may be easier to accomplish if it’s planned as part of a complete circumnavigation, because the prevailing conditions are then used to best advantage. Sailors hailing from the U.S. West Coast who aren’t tempted by a complete round-the-world voyage have the choice to return home by way of a shorter Pacific circular voyage. The turning point of such a voyage can be either Australia or New Zealand, from where the return route must dip south to make the necessary easting in the area of prevailing westerly winds. Having reached the Austral Islands, the southernmost island group in French Polynesia, sailors on this route turn north to Tahiti and continue via the Line Islands to Hawai’i and eventually home again to the States. 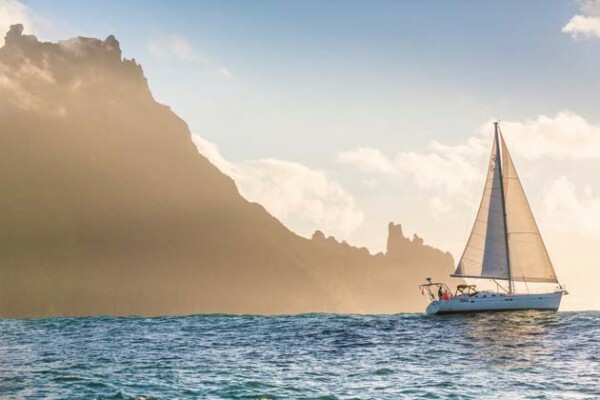 As in other tropical areas of the world, the best weather conditions in the South Pacific are a feature of the winter months, May to October, and for this reason, most sailors plan to arrive in the Marquesas in late March or early April. Although officially the South Pacific cyclone season lasts from November to April, the Marquesas are very rarely affected by tropical storms, and such an early arrival can be considered to pose a low risk. The main attraction of such an early arrival, especially for those on a tight schedule, is the opportunity to use the safe cruising season to its full extent. Despite the huge distance between Panama and the Torres Strait, boats regularly cover the 9,000 miles in one season. Most boats follow the traditional route that sweeps in an arc from Panama to the Torres Strait. Favorable southeast trade winds are the usual feature of this route during the winter months. However, normal weather conditions can be affected by various factors, such as the El Niño or La Niña phenomena. For centuries, the people of the fishing communities in northern Peru and Ecuador have used the term “El Niño” to describe an annual warming of the offshore waters during December. Because this phenomenon usually occurs around Christmas, it was called El Niño, or the Holy Child, Current. El Niño is now used to describe extensive warming of the ocean surface across the eastern and central equatorial Pacific. It’s now accepted that El Niño affects weather far beyond the South Pacific. The latest El Niño episode occurred between 2009 and 2010. When the ocean temperatures revert to a colder period, it’s now commonly referred to as La Niña. During a period of La Niña, sea-surface temperature across the equatorial eastern Pacific Ocean can be lower than normal by 5 F to 8 F.
During a La Niña episode, a mass of cold water from the eastern South Pacific is pushed westward by the easterly winds and accumulates in the western part of the South Pacific. The rapid evaporation of the cold water as it collides with the warm air mass can cause widespread climatic disturbances. This happened during the current La Niña episode, in January 2011, when torrential rains caused disastrous flooding from Queensland, Australia, to Sri Lanka, off the southern coast of India. A constant feature that affects weather conditions throughout the tropical South Pacific is the South Pacific Convergence Zone. The S.P.C.Z. stretches in an east-southeast direction from about 5 S, 155 E to 20 S, 150 W and can influence weather conditions all the way from Tahiti to the Solomons, although its effects are particularly felt in the central area between French Polynesia and Tonga. The S.P.C.Z. moves northeast during El Niño and southwest during La Niña events. The location and movement of the S.P.C.Z. are monitored by the Fiji meteorological office. The route from Panama to the Torres Strait passes through some of the most attractive cruising destinations in the world, with a choice of alternative itineraries all along the way. There are three major alternatives to reach Tahiti from Panama, each with its own attractions. Those who are keen to reach the South Seas as quickly as possible have the choice of sailing the direct route from the Galápagos to the Marquesas. While this is the fastest way to reach Tahiti, a tempting alternative is to sail a more roundabout route that swings south from Galápagos to call at such rarely visited places as Easter Island and Pitcairn. The latter is still home to the descendants of Bounty’s mutineers, and visiting sailors are always assured of a warm welcome. By this route, landfall in French Polynesia is made at the Îles Gambier, where, as in the case of arrivals in the Marquesas, those islands shouldn’t be reached before the end of March as, occasionally, cyclones, or at least their effects, have been felt as far east as the Gambiers and even Pitcairn. An even more ambitious alternative is to sail due south from Panama to Ecuador and Peru, then continue from there to Easter Island and beyond. The main attraction of this route is the opportunity to gain an insight into some of South America. To visit the interior, you can leave the boat at the Puerto Lucia Yacht Club, in La Libertad in Ecuador, a convenient place from which to visit the Andes or the Amazon, since about a third of the Amazon Basin is located in Ecuador. In Peru, the port of Callao, close to the capital, Lima, can serve as a base at which to leave the boat while touring Inca ruins, Lake Titicaca, and even some of the neighboring countries. A possible objection to these two southern-route options is that they miss the Marquesas, to my eyes the most beautiful of all the French Polynesian archipelagos. However, this need not necessarily be the case, as from the Gambiers you can sail north to the Marquesas, visiting some of the outer Tuamotus on the way to Tahiti. Another possible alternative detour from the Gambiers is to the Australs. With good planning, any of these objectives can be reached, and the additional mileage more than justifies the effort of stopping at some of the least-visited islands in the South Pacific. Tahiti has been a favorite landfall for mariners ever since its discovery by the outside world. From sailors to painters, musicians to film stars, its temptations have proved irresistible, and this fascination with the symbol of the South Seas continues to this day. Over the years, Tahiti’s capital, Papeete, once a quiet backwater, has turned into a busy city dominated by noisy traffic that thunders past its attractive waterfront. Take a short walk from there to see a glimpse of old Tahiti that still survives at the vibrant daily market, with its dazzling displays of vivid tropical colors on the fruit and flower stands. The onward passage to Fiji can be sailed at any time during the safe season, its timing depending primarily on your plans after you leave there. The westbound route is straddled by several attractive island groups, and it won’t be easy to decide which ones to bypass. Sailors leaving Bora-Bora, in the Society Islands, face a choice of a northern route, which touches upon the northern Cooks and continues to either Tonga or the Samoas, and a southern route, which reaches Tonga via the southern Cooks and Niue. An interesting stop shortly after leaving Bora-Bora is Maupiti, a small Society Island atoll that’s accessible through a pass in the reef. Another one is at Aitutaki Atoll, the nearest of the Cook Islands. A swing to the northwest leads to Suwarrow, an uninhabited atoll and longtime favorite among sailors roaming the South Pacific. Another perennial favorite is Vava’u, Tonga’s northern group, which boasts one of the most beautiful settings in the world. For sailors heading west from the ancient Kingdom of Tonga, Polynesia gives gradually way to Melanesia at Fiji’s eastern islands, the point where those two ethnic entities blend into each other. Once you reach Fiji, an important decision needs to be made, especially late in the season: Will you sail to either New Zealand or Australia for the cyclone season or continue to Vanuatu, the Torres Strait and beyond? Besides the annual cyclone season, one other matter of certainty in the South Pacific is that even the best-laid plans may have to be drastically revised, and due to its location, Fiji is the place where the fate of many voyages, or at least their new direction, is decided. From Fiji, the main transpacific route continues to northern Australia. This is the route sailed by boats bound for the Indian Ocean, often as part of a voyage around the world. Those who intend to take the Cape of Good Hope route need to pass through the Torres Strait by early September so they’ll have enough time to reach South Africa by early November, before the start of the cyclone season in the southern Indian Ocean. The timing for boats bound for Southeast Asia and the northern Indian Ocean is more flexible, as the passage through Torres Strait can be delayed until October. Weather conditions in September across the Coral Sea, off the northeast coast of Australia, are favorable, with consistent southeast trade winds all the way to the Torres Strait. Few sailors plan to make the long passage without stopping at some of the islands scattered about the Coral Sea. A detour to the Solomons and Papua New Guinea requires more time and may not fit easily into a tight schedule. Rather than sail directly to the Torres Strait, an attractive alternative is to divert to northern Queensland, where Cairns is a convenient port of call with good repair and provisioning facilities. From there, the route stays inside the Great Barrier Reef and enters the Torres Strait from the south. To do it proper justice, the South Pacific deserves more than just one season, and for this reason, most boats spend at least two winters there, usually by leaving the tropics for the cyclone season, sailing south to New Zealand or Australia or north to Papua New Guinea and Micronesia. Those who prefer to remain in the tropics during summer can find shelter in one of the few safe harbors or all-weather marinas. For those who wish to continue cruising, there are a few hurricane holes in Tahiti, Vava’u, Pago Pago, the islands of Samoa, and Fiji, although in some countries, the authorities insist that visiting yachts leave the country before the onset of the cyclone season. One of the advantages to spending the summer season outside the tropics is that one is able to go to a place with good repair and service facilities. A popular destination is New Zealand, where voyagers can find various marinas offering a wide range of services. Similar facilities are also available along Australia’s east coast. In the islands, the best repair centers are those in a location that supports its own boating community, such as in Tahiti; the capital city of Suva, in Fiji; Nouméa, in New Caledonia; and Port Moresby, in Papua New Guinea. The establishment of charter operations in Raiatea, in the Society Islands; in Vava’u; and in Fiji has brought about a noticeable improvement in the standard of facilities there. On passages to New Zealand in November, the winds are mostly from east or southeast down to about 28 S or 30 S. From there on, the winds can come from any point on the compass, but because the passing of a front or depression usually results in a spell of northwesterlies, it does no harm if some westing is made while under the influence of those southeasterlies. An interesting stop south of Fiji is at the Minerva Reefs, which have temporary anchorages and are popular with boats sailing this route. However, as they lie slightly east of the direct route, perhaps it’s better to call there on a return voyage the following season. Those who intend to spend the cyclone season in Australia should continue west from Fiji and sail to a port in the Australian states of New South Wales or southern Queensland. Both Vanuatu and New Caledonia lie close to this route and provide the opportunity to experience the very different cultures of these two Melanesian nations. In the former, a traditional way of life still survives in the outer islands, while in the latter, the strong French influence has brought about the opposite result. How long will it be before this happens throughout the South Seas? Opinion is often sharply divided over the use of davits. The advantages are obvious – quick stowage of the tender without having to remove the engine, fuel tanks and so on. On the downside, however, there’s more weight placed at the very aft end of the yacht as well as a risk of the dinghy being vulnerable to big waves. 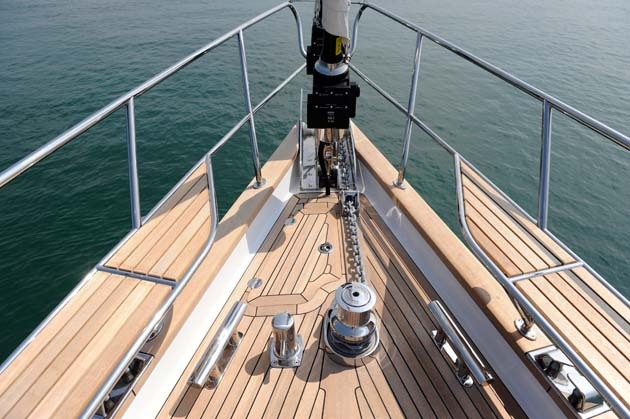 A simpler alternative is to use a halyard to lift the boat vertically onto the foredeck. Normally this is a two-person operation, with one grinding the winch, while the other guides the boat, holding it off the hull. 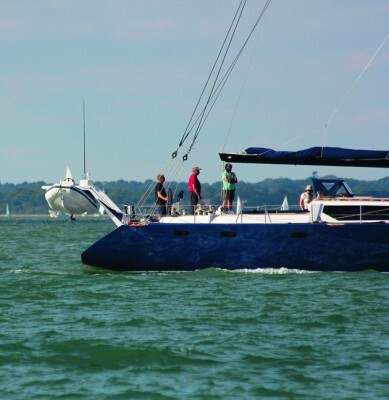 It’s also possible to combine both approaches – stowing the dinghy on the foredeck for long passages, but using davits for shorter sails in good weather. Marina facilities around the world have improved enormously over the past few decades, but there are still plenty of locations in which a decent dinghy is as much of a vital workhorse as the family car. Even if your plan is to use it solely with an outboard, it should be possible to row it efficiently. Flat-bottomed inflatables fall down in this respect – an inflatable keep, or rigid hull structure makes rowing much easier, as does a pair of long (7ft minimum) oars. There’s much to be said for choosing the lightest feasible tender for easier handling and stowage. As well as facilitating hauling it on board, a lightweight dinghy can be carried to safety well up a beach, without damaging the bottom and can be powered by a smaller engine. Anything over around 2.8m is likely to suffice as a decent workhorse, provided the tubes are of sufficient diameter – aim for a minimum of 45cm. 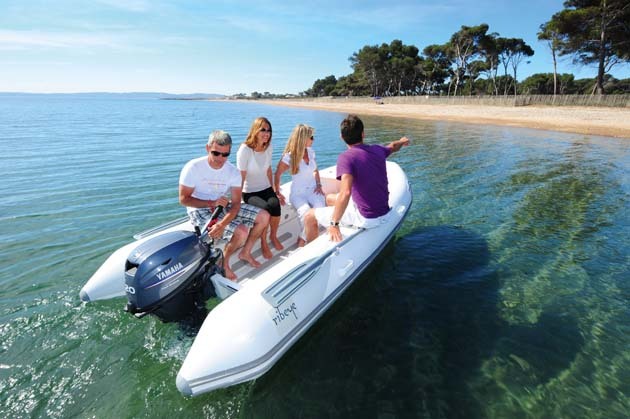 Air floor types offer a great compromise between good performance on the water, weight and easy stowage, although they can’t match the handling of a proper RIB-style tender. If you have space it’s worth considering taking a second dinghy – in many ways this is akin to having two cars, allowing different groups of crew to come and go to their own schedules. A second tender will also enable you to continue cruising without undue interruption should the main one be lost or stolen – the more remote the destinations you plan to visit, the more this makes sense. Even with relatively small engines on a folding or all-inflatable tender, a crane to lift the engine on board is an important investment. It’s all too easy to fall into the water when transferring the motor, even on boats with a good bathing platform. Similarly, if the engine is removed from a dinghy stowed on davits before a passage there’s less weight at the back of the yacht and the strain on the system is reduced. Carrying petrol for an outboard can be a pain – it’s therefore worth considering an electric outboard. These are neat and convenient, with better inherent reliability than petrol versions and have reduced servicing requirements. For instance, a Torqeedo Travel 1003 gives thrust equivalent to a 4hp conventional outboard and yet weighs 13.4kg, including an integral battery large enough to power the boat for three hours at half throttle. A propane outboard may also be worth considering, if you have suitable stowage space for the fuel. These can be powered from refillable containers, as you would for cooking gas, or by standard 16.4oz (465g) disposable camping bottles. The latter gives around 80 minutes of running at two-thirds throttle on the 5hp motor.